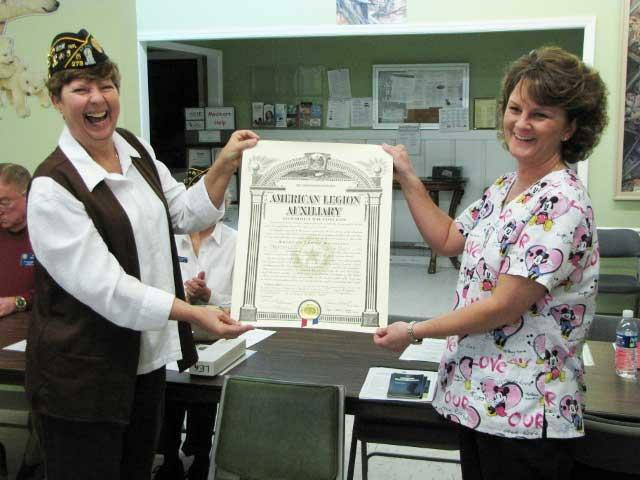 At last Thursday night's monthly meeting of the Hilton Stone Post 279 chapter of the American Legion, the Auxilliary unit was awarded their Charter by the Department of Tennessee of the American Leader. Shown here are on left Christine Barrett, Sgt. at Arms of the Hilton Stone Post along with the president of the Auxilliary Carol Davis. Carol you are doing a remarkable job for all our troops..Thank you and God Bless You.. Thank you to my Mom and Dad Barrett for doing all they do for the Troops and Veterans!